The 320th medic was among the first African Americans to land on Omaha Beach at 9 a.m. on June 6, 1944. 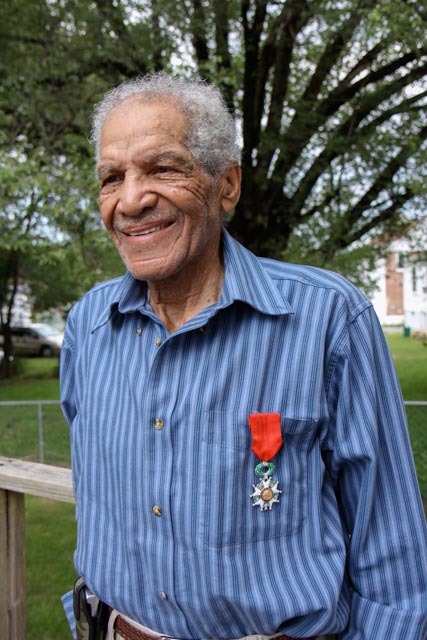 The French government awarded William Dabney the Legion of Honor in Paris in June 2009 in recognition for his service on D-Day. Read Linda Hervieux's article about Dabney’s award here. Dabney enlisted in the Army at age 17, too young for the draft but longing to serve like most of his friends. “If you weren't called up, you were all but eliminated with the ladies,” he explained with a twinkle in his eye. “They thought you were a 4-F” — military code for unfit for service — “that you couldn't make the grade." On June 6, 1944, the teenager from Roanoke was now Corporal Dabney, a balloon crew chief. Holding his rifle above his head, he plunged from a flat-bottomed metal boat into waist-deep water off Omaha Beach. Deafening booms mingled with the incessant brrrppp brrrppp chatter of enemy machine guns and the sip sip sip of their bullets skipping across the fine golden sand. Hot metal hit Dabney in the leg. He taped it up and kept going. A barrage balloon the size of a Buick had been clipped to his belt, but now it was gone. Where did that damn balloon go? He couldn’t worry about it. Now it was time to save himself. William Dabney (left) poses with a cousin in this undated photo. William Dabney wears the French Legion of Honor that he received at a ceremony in Paris in June 2009. The medal is France’s highest honor and was given to Dabney for his service on Omaha Beach on D-Day. Bill Dabney and Harry Cecil Curtis, Jr., met at Camp Tyson, Tenn., and remained lifelong friends. Curtis was a member of the 318th Barrage Balloon Battalion, one of four black balloon units. Curtis died in October 2012. Wilson Monk poses with a barrage balloon likely at Camp Tyson, Tenn.
Henry Parham’s draft letter landed in his mailbox in Richmond, Va., in December 1942, one month after he turned 21. "They got me," he said.